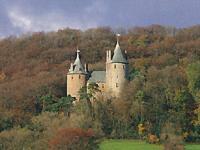 Castell Coch is a late nineteenth-century fairytale-style castle, built on medieval remains. It was designed for the third Marquis of Bute by William Burges. The Castle is lavishly decorated and furnished in the Victorian Gothic style - a Romantic vision of the Middle Ages. How to get there by car: M4 (Junc 32), A470 then sign-posted. How to get there by bus: 1km/0.6mls Tongwynlais, route Number 26, Cardiff - Tongwynlais/Tredegar. How to get there by train: 2.5km/1.5mls Taff's Well, on the Cardiff - Taff's Well/Merthyr Tydfil/Aberdare/Treherbert line.